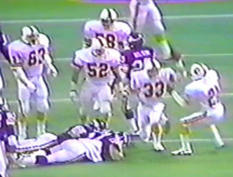 James Wilder gained over 100 yards rushing/receiving for the eighth time in 10 games but ended up on the losing team again. 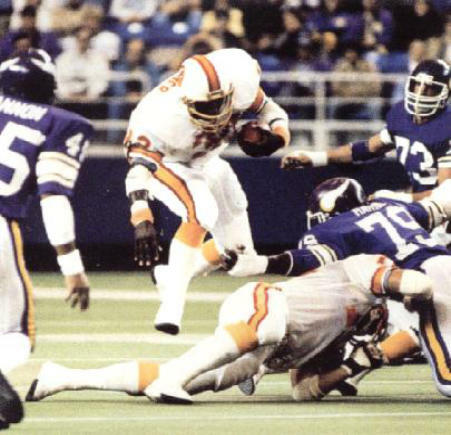 The Bucs tied the score with 1:03 remaining on Kevin House's 11-yard grab from Steve DeBerg and it looked like their third overtime game of the season until the veteran Jan Stenerud connected on a 53-yard fieldgoal with three seconds left for the victory. This was the game that led John McKay to announce his retirement after he and owner Hugh Culverhouse had feuded over the cost of signing Stenerud before the season started. INDIVIDUAL STATISTICS RUSHING BUCS: Wilder 30-146, DeBerg 2-7. VIKINGS: Anderson 13-52, Brown 10-32, Nelson 5-32, Coleman 1- 13, Wilson 3-6, Lewis 1-5, Jordan 1-4. 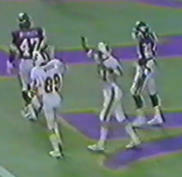 PASSING BUCS: DeBerg 36-17-198-1-1. VIKINGS: Wilson 36-24-236-2-1. RECEIVING BUCS: Wilder 4-46, House 4-30, Dixon 3-45, Carter 2-25, Giles 2-16, J.Bell 1-26, Armstrong 1-10. VIKINGS: Brown 9-86, Jordan 5-43, Jones 4-50, Lewis 2-19, Nelson 2-10, White 1-23, Anderson 1-5. INTERCEPTIONS BUCS: Cotney 1-22, Castille 1-8. VIKINGS: McNeill 1-0. KICK RETURNS BUCS: Morton 4-91, Bright 2-33. VIKINGS: Nelson 5-112. PUNT RETURNS BUCS: Bright 1-12. VIKINGS: Nelson 2-20. 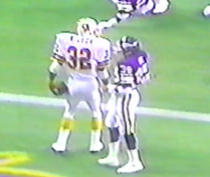 SACKS BUCS: Selmon 1-12, Washington 1-6. VIKINGS: Browner 1-8, Bess 1-7.